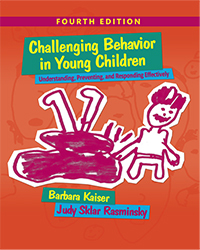 We’ve been thinking a lot about how administrators of early childhood programs and schools can support staff, families, and children when challenging behavior appears. Directors, supervisors, head teachers, principals–whatever they may be called–have a crucial role to play in enabling children with problem behavior to succeed. Read all about it in our article, “Challenging Behaviors: How Directors Can Help,” in the November-December 2018 issue of Exchange magazine. Do you have tips for supporting the people in your program in this situation? We’d love to hear from you.